The AFG-3000 Series is arbitrary waveform generator designed for industrial, scientific research and educational applications. The series comes in bandwidths of 80MHz (AFG-3081) and 50MHz (AFG-3051) with built-in multiple standard waveforms to meet users' diversified needs. The AFG-3000 Series also provides a high 16 bit resolution, 200MSa/s sample rate and a 1M memory depth for editing arbitrary waveforms directly through the intuitive user interface. The Direct Waveform Reconstruction (DWR) function enables users to directly import waveforms from a GDS-2000 Series oscilloscope to the AFG-3000 via USB host, allowing users to edit waveforms and enhance measurement efficiency. In addition, the AFG-3000 Series has switchable 50 Ohm and Hi-Z Impedances, built-in On-Screen Help for operation conveniently. Complete parameter settings and waveform can be displayed through 4.3-inch high-resolution TFT LCD. Through USB, RS-232, and GPIB, user can use dedicated PC software or IEEE488.2 commands to edit waveforms. 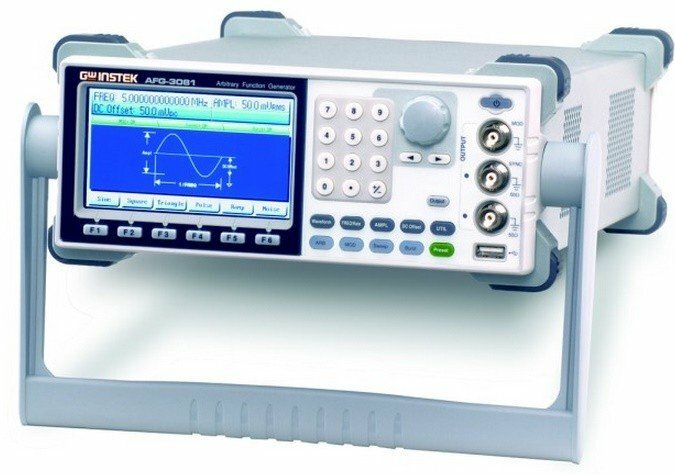 The AFG-3000 series arbitrary waveform/ function generator employs direct digital synthesis (DDS) technology to generate and output a variety of stable and precise waveforms. The frequency operates at up to 80MHz (AFG-3081) or 50MHz (AFG-3051), with a minimum resolution of 1uHz for the entire frequency range. The built-in standard waveforms include sine, square, triangle, ramp, pulse, noise and other types of waveforms. The Modulation functions, including AM, FM, FSK and PWM, are provided to cover a broad range of market requirements. A dedicated terminal for the modulating signal output is available in the front panel for modulation monitoring or other control purposes. Either an internal signal or an external signal can be selected to perform the modulation. FSK is a frequency modulation scheme in which digital information is transmitted through signal frequency variation. The BFSK (binary FSK) modulation, using two frequencies to represent data 1 and 0 respectively, is commonly applied for Call ID and Remote Metering applications. PWM is a digital modulation scheme that can be used to adjust the output power level by controlling the pulse width of the driving signal. The examples include the speed control of motor rotation and the luminance control of LED lighting instrument. With the pulse width variation of driving signal, the rotating speed of motor and the luminance of LED will change accordingly. The Sweep function supports three trigger modes of INT, EXT and manual, and two sweep modes of LOG and LIN. Each time a sweep signal is perceived, the function generator will start to sweep through the user-defined frequency range by the frequency variation of either Log curve or Linear curve. The Burst function supports two modes of Gate and N Cycle. To run burst function, the burst repetitive rate has to be set first, then the time duration of each burst has to be defined under Gate mode, or the number of the waveform cycles in each burst has to be set under N Cycle mode. Under both Gate mode and N Cycle mode, the burst waveform polarity and phase can be controlled. The profile of arbitrary waveform is composed of a series of data. The frequency of arbitrary waveform is derived from sampling rate divided by the number of points constructing a complete waveform, i.e. frequency = sampling rate / the number of points in a waveform. Based on the above, the higher the sampling rate, the higher the arbitrary waveform frequency can be available. A Sine waveform composed of 100 points waveform data is able to have a 2MHz frequency with 200MSa/s sampling rate, but can only have 1.25MHz frequency with 125Msa/s sampling rate and 0.5MHz frequency with 50M sampling rate. 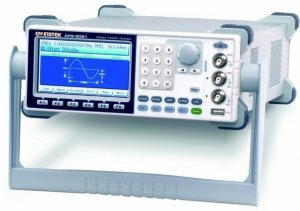 AFG-3000, possessing a sampling rate of 200Msa/s, is able to generate a waveform up to 100MHz for a simple waveform composed of 2 points of data. The 16 bit amplitude resolution can display smooth waveforms, while a lower bit resolution will display jagged or less smooth waveforms. For example, if 10V is divided into 10,000 equal parts, each part would have a resolution of 1mV. When using a 16 bit resolution, the smallest possible bit resolution is 0.15mV (from 10V). With 16 bit resolution, the 10,000 parts will appear to be a smooth straight line, while the bit resolution of 12 bit would be 2.4mV, greater than the 1mV needed. In this case the straight line would appear like a ladder. The AFG-3000 Series provides 10 sets of memory for user save and recall applications. Each set of memory is able to store a set of front panel setting and a set of 1M-point arbitrary waveform data. With 1M long memory, AFG-3000 can store more complex waveforms consisted of more data. Further more, any section of waveform within this 1M memory can be edited or output independently. This is a unique feature allowing more flexibility for user to do waveform storage and extraction. The AFG-3000 presents four ways to generate custom arbitrary waveforms from direct front panel operation, PC software, a CSV file loading, and GDS-2000 series oscilloscope input. Everything from waveform editing, I/O configuring, and panel setting storage and recall can be completed directly through front panel operation. Front panel operation allows users to edit arbitrary waveform, which is correspondingly updated on the screen, a feature of "What You See is What You Get". AFG-3000 supports CSV file editing for arbitrary waveform generation. The CSV file can be created in many ways, including using EXCEL spreadsheet, PC client software, front panel editing or math computing software. The computing result of math software, Octave for example, can be saved into CSV file. Edited CSV file can be downloaded from either USB flash or PC to AFG-3000 for arbitrary waveform output. The AFG-3000 can be directly connected to a GW Instek GDS-2000 Series DSO with USB cable for waveform data download. Under "DSO Link" mode of AFG-3000, the DSO will transfer the captured waveform data from its memory to AFG-3000 for creating a correspondent waveform output. A PC software for AFG-3000 waveform editing is supported. The software contains not only waveform drawing tools but also a wide variety of waveform editing functions, such as waveform arithmetic operations. The most commonly used waveforms, including Rayleigh, Gaussian, Normal Noise, Pseudo Ternary, Bipolar AMI, Manchester, Differential Manchester, RS-232, and NRZ etc., are available in the library for user to tailor specific waveforms as needed. AFG-3000 allows users to select the suitable impedance between 50 ohm and High-Z, ensuring a right impedance compatibility. The built-in On-Screen Help allows users to understand AFG-3000 operations and the definition of each function key. The AFG-3000 provides GPIB, RS-232, and USB as standard communication interfaces. AFG-3000 supports IEEE 488.2 protocol and command for users to integrate system or remotely control the instrument. The AFG-3000 is equipped with a 4.3" LCD screen of 480 x 272 resolutions. In addition to displaying all of the settings on the screen, the large graphic display also allows users to observe complete waveforms at a glance. (2). Add 1/10th of output amplitude and offset specification per ∘C for operation outside of 0∘C to 28∘C range (1-year specification). (3). Edge time decreased at higher frequency. (4). Sine and square waveforms above 25 MHz are allowed only with an "Infinite" count. (5). Harmonic distortion and Spurious noise at low amplitudes is limited by a -70 dBm floor.